It had been about 15 years since this Bothell home had seen any major maintenance on the deck also the original deck supports were listing. The owner did not like the layout and had wanted to replace the deck for some time. The old deck, for security reasons, had no stairs to the ground. The current owner had dogs and wanted them to have access to the back yard. We were able to provide access to the ground and keep privacy at the same time. A second requirement was keeping ongoing maintenance low. 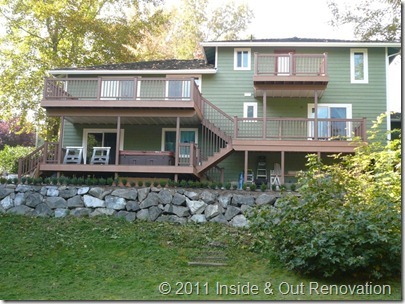 This was accomplished through the use of TimberTech deck and rail products. The only maintenance is an annual washing and the deck is ready for another season. The third and final requirement was to have livable outdoor space under the deck which was accomplished using TimberTech’s Dryspace. To allow for easy use of the stairs and deck at night, the deck is lit with Vista LED lighting.